2007 was a long, long time ago. Spider-man 3 ended the Sam Raimi trilogy somewhat dubiously, San Diego Comic-Con wasn't nearly the major market research even it is today and a new title named Ghoul Scouts was in development. The title was originally known as Zomboy Scouts, but now the title is being released by Action Lab Comics under the former name in June. 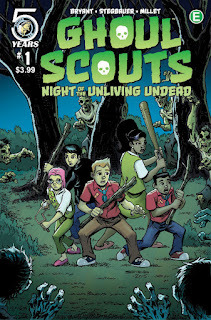 Girl Scouts: Night of the Unliving Dead #1 is written by Steve Bryant and illustrated by Mark Stegbauer. The story features a group of boys trying to get home from a scouting campout during a zombie outbreak. At the conclusion of the adventure, the boys would realize that there was something strange about their town and that they were the only line of defense against the weirdness. The second volume would introduce an all-girls rival group called the Ghoul Scouts, and we’d have two companion series: one starring four boys and one starring four girls. 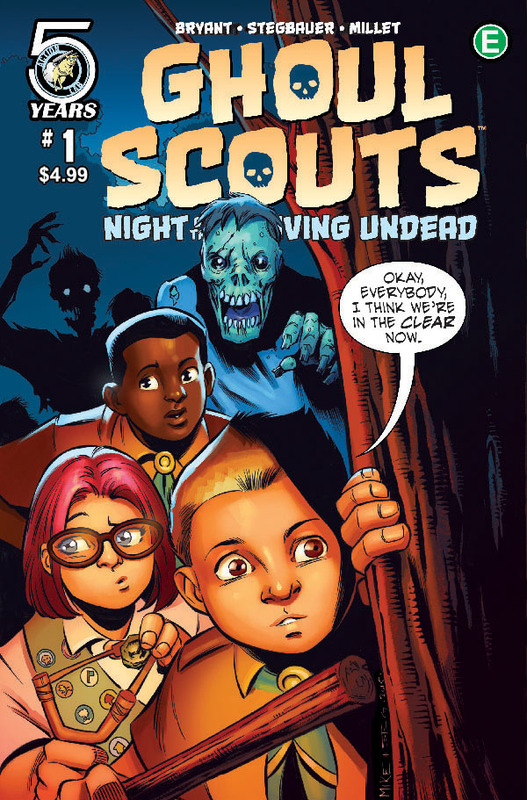 Girl Scouts: Night of the Unliving Dead #1 (Diamond Item Code: APR161112) features covers by Stegbauer and variant covers by Mike Norton and Sean Izaakse ships in June. Full press release below. Eisner nominated Athena Voltaire creator, Steve Bryant talks about his new series for Action Lab. Ghoul Scouts development began back in 2007, in an email exchange with a friend discussing our weekends. She did normal things like spending time with friends and playing video games. For me, any time that wasn’t devoted to having fun with my son, Chance, was focused solely on making comics. As many comics folk will tell you, making comics can be an all-consuming pastime that leaves little room for other interests. Her: I LOVE that you related being able to play “Dead Rising” to being more "well-rounded." Me: Zombie killing is a skill that creates well-rounded people. Everyone knows that. It's in Chance's Cub Scout manual, page 147. He can earn a zombie-killing badge and everything. And it snowballed from there. I was most excited about having a comic I made that I could share with my son. He was 7 years old when the above discussion took place. This would be the perfect book to read with him! 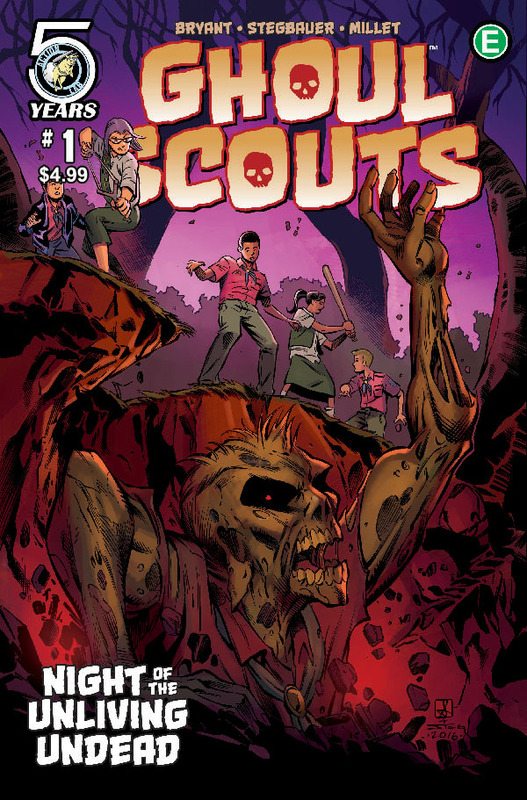 The original title of the series was Zomboy Scouts, and it featured a group of boys trying to get home from a scouting campout during a zombie outbreak. At the conclusion of the adventure, the boys would realize that there was something strange about their town and that they were the only line of defense against the weirdness. The second volume would introduce an all-girls rival group called the Ghoul Scouts, and we’d have two companion series: one starring four boys and one starring four girls. I had so much worked out in my head: a series, a spin-off, a couple of cool titles and a number of plots, but I didn’t have an artist. I write and draw comics, but, as an artist, it’s important to understand when your style is appropriate, and when it is not. I can occasionally work in a cartoony style, but there’s a lot of struggle to get the artwork looking consistent and polished. I needed to find someone who could breathe life into these characters. Finding the right artist for a project can be a time-consuming process. Believe me, I know. Enter Mark Stegbauer. Mark has spent years inking superhero and adventure comics, and he does it well. However, Mark is a crazy-talented cartoonist, as well. After seeing his creator-owned title Doctor Goyle, which he writes and draws, I knew his style was perfect for Ghoul Scouts. In 2014—seven years after starting to play with the idea of scouts versus zombies—Mark and I started work together on the Zomboy Scouts pitch. Early in the process, I started sharing pitch text and story beats with Chris Murrin, whose editorial insights have been invaluable to my Athena Voltaire work. Chris loved the premise and characters, but wasn’t crazy about the title. After living with it for years, I wasn’t about to change the title, just because Chris couldn’t see the brilliance of it. Nope. I was digging my heels in on this one. GHOUL SCOUTS: NIGHT OF THE UNLIVING DEAD#1 (Diamond Item Code: APR161112) by Steve Bryant and Mark Stegbauer, featuring covers by Stegbauer and variant covers by Eisner Award Winner Mike Norton (REVIVAL, BATTLEPUG) and Sean Izaakse (STRAY, ACTIONVERSE) ships in June.